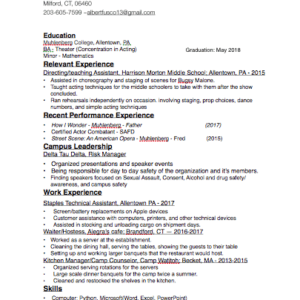 Resume posted by albertfusco13 in Theatre. Freshly graduated from Muhlenberg College with a Theater degree and math minor, I have used my skills in a multitude of ways. Both in the Theatrical world as well as in sales, i have been able to excel in every position i have taken on. I graduated from Hamden Hall CDS in 2014. I also just recently graduated from Muhlenberg College with a BA in Theater and a minor in Mathematics. I also am a certified Actor Combatant with certification in 4 different SAFD certified weapons. Assisted in choreography and staging of scenes for Bugsy Malone. Taught acting techniques for the middle schoolers to take with them after the show concluded. Being responsible for day to day safety of the organization and it’s members. Assisted in stocking and unloading cargo on shipment days. Worked as a server at the establishment. Setting up and working larger banquets that the restaurant would host. Large scale dinner banquets for the camp twice a summer. Cleaned and restocked the shelves in the kitchen.